We are going to start a new column which features a crosstalk with coaches, atletes and managers attending the next World MTB Orienteering Championships. By Paolo Mutterle. They are coming from Down Under to go for gold again, despite they have to get used to new maps and terrains, and, as usual, to "riders and cars travelling on the wrong, that is right side of the road". Here we are with Aussie national MTBO coach Kay Haarsma, probably best known for being the first Australian woman to run 100 miles in less than 24 hours. "Because Australia is a long way from Europe time-wise and financially" she says, "our riders can never visit the WOC venue country before the Championships. This is a huge disadvantage, as there is a lot to be learnt from a visit the year or some months beforehand. I try to overcome this by getting reports from friends in other teams about the terrain, maps, course setting etc. It is very important to have electronic copies of old maps and other relevant maps available. Our team normally arrives in the host country about 10 days beforehand to get some familiarisation with local conditions and thus it is ideal for us if there is a competition, however low key, organised the weekend before WOC. Reigning world champion Adrian Jackson's presence is still in doubt. "At this stage, it is unsure whether he will be available this year for MTB Orienteering. He is targeting the cross country mountain bike worlds and trying hard to make the Australian team for this, and those championships are about the same time as the MTBO events. Our main selection trials are on April 9-10th in Victoria and our team will be announced within that next week. These trials must be early because of the need for riders to book flights request so much time of work". "I expect that we will have 4-6 elite riders and about 4 junior boys. We sent three juniors away last year - the first time we had JWOC representatives. They rode quite well despite being relatively young and this has motivated a number of other juniors to train and try for the team, which is exciting. The high cost of travelling to Europe for annual World Championships means that we don't always have all our best elite riders available as they have to pay the majority of the costs themselves", Haarsma says. In spite of distance and difficulties, Australia has a good tradition for MTBO. "At the inaugural world champs in 2002 our top girl, Emily Viner won a silver medal. This gave us a lot of confidence that we could be competitive at this level and with the Worlds in Australia in 2004 we had a great group of ex-foot-orienteers who targeted this event. We gained 3 individual medals (one of each colour), won bronze in both relays and had 4 other podium positions. So it was a good result overall. Adrian Jackson's three medals from the 3 individual events last year was an outstanding achievement". According to Haarsma, "Event wise it is always a bit nerve racking experiencing a WOC in a new country, as the organisation always is just a little different. 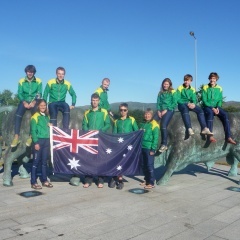 I was Australian coach to Italy for a foot JWOC some years ago and that was certainly very well run. Maurice Ongania, one of your main event organisers, was a former Aussie foot orienteer at WOC, so at least there is one person I know there". Kay is the national MTBO coach, which is a volunteer position. Recently she started a part-time paid position as High-Performance Manager within her federation. She represented Australia in elite foot orienteering and was a member of the team at the first WMTBOC in 2002 in France. As an athlete she is best known for being the first Australian woman to run 100 miles in less than 24 hours in the 80's. In 2002 she was in the winning Elite women's team in the World Rogaining Championship in Czech Republic and also won the Women Elite class of Bike Adventure. Last year she won her age class (55-59) in the solo world 24-hour Mountain Bike Championship.